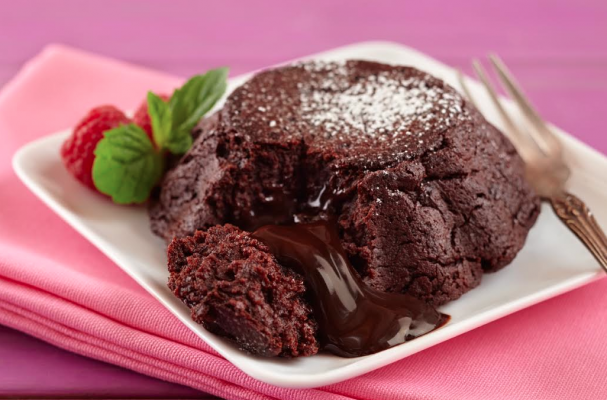 Everyone needs a good chocolate molten lava cake recipe in their life. This one packs a punch, a punch of protein that is. Tofu creates the bulk of the dough so you can limit the amount of eggs and flour. Since it is Cinco de Mayo, I like to add a 1/2 teaspoon each of cinnamon and chile powder to give these cakes a Mexican twist. Step 1: Preheat your oven to 450 F, and position a rack in the center of the oven. Lightly butter your ramekins and line with cocoa powder. Tap out the excess cocoa powder, and set the ramekins aside. Step 2: Fill a medium pot with about 2 inches of water and place over medium heat and bring to a simmer. Place a heatproof bowl over the simmering water, making sure that the bottom of the bowl doesn’t touch the water. Add in the chocolate and butter, and melt, stirring often with a spatula. Set aside to cool once melted. Blend together the tofu, egg yolks, and sugar in a blender until smooth, making sure to scrape down the sides of the blender a couple times. Editorial Disclosure: Foodista was not paid for this post.